. 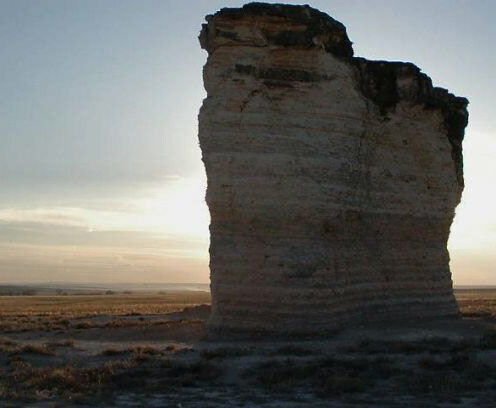 . . she took an alternate route to town so she could drive past a local landmark, a set of famous rock monuments that rose high above the ground, looking like a natural, bigger, taller Stonehenge, a startling contrast to the rest of the flat landscape. 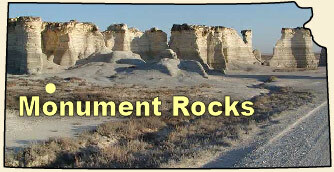 Testament Rocks, as they were known, attracted about the only tourists her county ever saw--archaeologists, geologists, and paleontologists, for the most part. A great inland sea had once surged through this area, an enormous body of water replete with prehistoric sharks and other sea-faring creatures; later a vast river took its place. Just to look at Testament Rocks gave Annabelle the sense of being part of something bigger, something almost incomprehensibly old that changed so slowly the alterations were nearly imperceptible unless you watched them for a lifetime. Only erosion, pollution, earthquakes, or dynamite could alter this landscape; cataclysmic change came rarely, but it did come now and then. 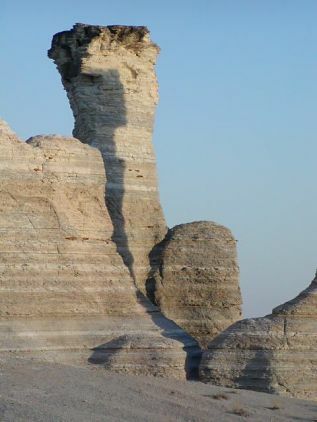 The head of a high rock formation known as the Kind had been shattered by lightning a few years before, and she still mourned its disfigurement. In a certain light, the Testament Rocks turned white as bleached seashells. 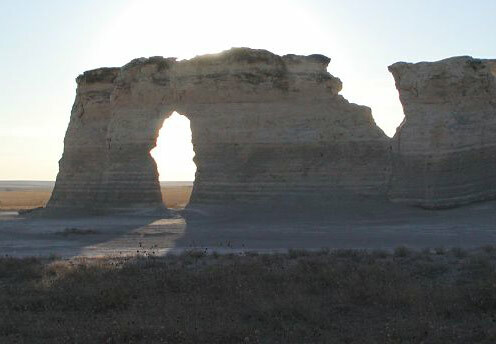 At those times, when Jody walked into that landscape, she felt like a black dot on a white slate, as visible as a prairie dog to a hawk, as uncomfortable as if she were naked in public. It was her least favroite light at the Rocks, because it washed out all other color, all subtlety of tone, and it was blinding. . . . there was wind on this day, blowing bits of white dust around her. She stared up, and felt entranced by the sky again, aned soothed by the cool wind between storms. She felt embraced by the bast landscape that had previously felt so barren and dead to her. It wasn't lifeless at all!! 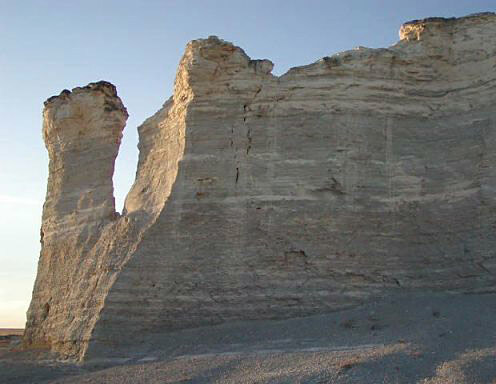 the eighty-foot rock formations that rose beside, and above, and all around her looked like living creatures now, protectively watching over her with their sharp, cold faces. After the hearings, Gillean needs air, needs space. 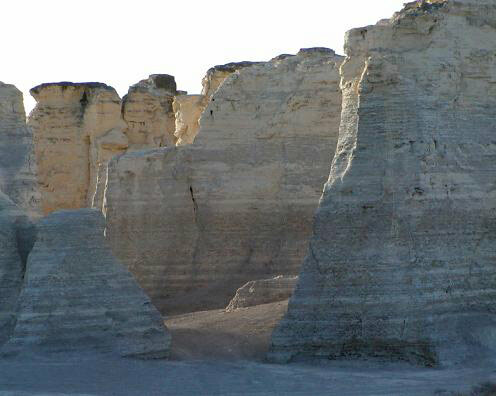 She drives to one of her fossil stations, the country roads around Monument Rocks. She loads a CD, her favorite chapters of Origin of Species, in the CD player, eager to hear the voice read Darwin's words about gratuitous mysteries, about his vain endeavor to grapple with eternity, about wonder and impressions and marvels. How she admires Darwin. Most people, she thinks, are so humbled by what they do not understand, cannot understand, that they turn it to miracle. In doing so, they do not worship miracles, they worship their own ignorance. She will be like Darwin, content with mystery, humbled by ignorance, but humbled even more by what she does understand. Darwin's words float in her mind as fossil creatures once floated in the ocean of Kansas: When I view all beings not as special creations, but as the lineal descendants of some few beings which lived long before the first bed of the Silurian system was deposited, they seem to me to become ennobled. With such words, such thoughts lifting to the heavens, Gillean walks under brilliant stars. She stands beneath the towering rocks. 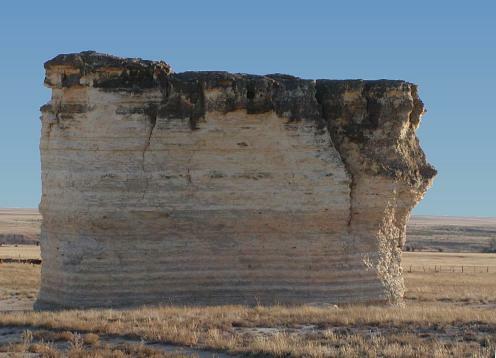 They are both remnant of, and monument to, the fossil sea of Kansas.